I had the opportunity to go to the Turning the Wheel Summer Workshop again this year. I wasn’t able to attend last year because I was in Paris, and the last time I went was back in 2008. It was nice a cyclical to go back right after graduating from college when the last time I went was right after high school. Everyday there was a chunk of time dedicated to creative playing. The options were Yoga, Drumming, and Collage. I chose to do collage and it turned out to be an adventure into my own creative spirit. We started the time with a small guided meditation exploring our “inner landscape.” Then, once the meditation was complete, we had access to over 5000 laminated images that had been collected over many years to create a collage of what our journey had revealed to us. We were not allowed to keep the images once our collage was complete, but the facilitators kinkoed the finished creations, and a good friend of mine took a pic with his nice camera. It was really exciting and refreshing to collage with images that had already been found for us. There were no distracting ads in magazines to mull over and no time was eaten up by cutting and glueing the images down. Instead we simply had to let our eyes wander over the tables overflowing with images, find the ones we liked, and tape them down. Once we chose the images we desired we also had access to a number of words which could be woven into the collage to create poem or infuse meaning. I didn’t end up making a poem, but instead chose words that were meaningful at the time to help me remember what I was thinking when I chose certain images. 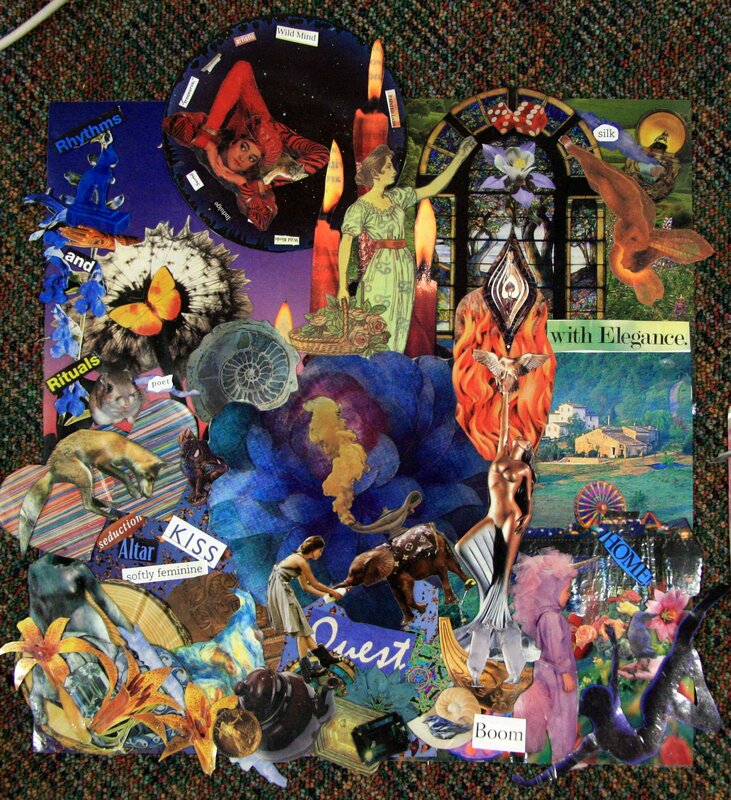 This entry was posted in Assorted Meanderings, Craft & Ritual, My Artistic Endeavors and tagged 2012, Collage, deeper understanding, Inner Landscape, Meditation, Myth, TTW by Khiri Lee. Bookmark the permalink.